Blippar: a QR code killer? We wrote about Blippar back in May before it launched, but now the app is out there and major brands are on board, we can see how well this alternative to QR works. This week, Tesco has been running ads in several national newspapers, with ‘Blippable’ content for users with the iPhone or Android apps. So is Blippar a better alternative to QR codes, or does it still suffer from some of the same drawbacks? First, let’s take a look at the Blippar app in action. I didn’t buy any of the tabloids yesterday, but there are a collection of ads on the company’s Facebook page that you can try the app with. Once you have the Blippar app, it’s a question of opening it and pointing it at the ad. Unlike QR codes, the whole ad is the response mechanism, so just pointing it in the general direction of the ad works. From this point, I have the option of viewing today’s recipe, or finding my nearest store via Tesco’s mobile site. There are other ads, such as this for Jurassic Park, which then sends me to a trailer for the movie, but you get the idea. So can Blippar become a QR code killer? This remains to be seen, and much will depend on building awareness of the app and getting it onto people’s mobile phones. 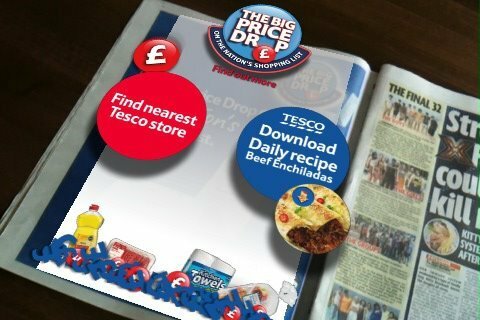 Of course, having a major brand like Tesco using it for the ‘Price Drop’ campaign will help, and the ad does encourage readers to download the Blippar app. Blippar does suffer from some of the same drawbacks as QR codes, namely the need to download an app, encouraging users to make the effort to get their phone out and fire up the app, as well as the task of building awareness (a recent survey found that two-thirds of consumers don’t know what QR codes are). These drawbacks are not impossible to overcome. For example, if you can build awareness and give people a compelling reason to scan ads, such as discount codes or promotions, then uptake will grow. Blippar does have some advantages over QR codes. There have been some excellent uses of QR, but some of the Blippar ads do provide more of a wow factor, while the user experience is smooth, the ads and landing pages worked very quickly when I tried them. With several high profile brands on board, including Cadbury’s, Eurostar, Samsung and more, as well as Tesco, Blippar is one to watch. Should mobiles and tablets influence your web design? If designers thought they had it bad having to deal with multiple browsers, the past several years have made it clear: IE6 is a walk in the park. Today, thanks to the rise of smart phones and tablets, designers are tasked with designing across a wide range of devices, many with different form factors, platform capabilities and hardware profiles. The future is mobile, so not surprisingly, when it comes to building sites designed for mobile and tablet devices, many companies think of their web experience and mobile/tablet experience as separate entities. That can be painful and costly, but a result of this could be that companies gain insights that allow them to improve the experiences they create for their users and customers. Hiscox recently won an Econsultancy award for Innovation in B2B Marketing, with a campaign that used wi-fi hotspots to target potential customers. Annabel Venner, Marketing Director for Hiscox UK & Ireland, will be speaking at our JUMP event on October 12.
i’ve been asking Annabel about planning and measuring multichannel B2B campaigns. In many ways, effective Adwords account management is a balancing act. Whether you’re trying to balance sales volumes with the cost per sale or trying to write a compelling advert whilst trying to stand out from your competitors, you’re often pulled in opposite directions. I am often approached to appraise accounts for advertisers, and one of the most common problems that I see is also perhaps one of the most understandable, it’s the result of failing to find the balance between relevancy and optimisability.